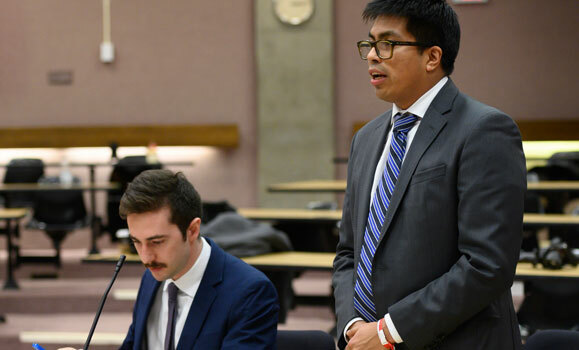 Congratulations to Schulich School of Law students Jason Kirsh and Jeremy Ryant, who won the 2019 Law Games Moot! The Law Games took place Jan. 2 to 5 at Sherbrooke University’s Faculty of Law in Quebec. Twelve teams from law schools across Canada competed in the moot portion of the Law Games, an annual competition that features academic and athletic events. Dalhousie was also victorious in the athletic portion of the Games, earning the overall award for most sports won. For the Law Games moot, each team was assigned a side, either appellant or respondent. The moot problem turned on two issues. First, whether the Quebec government fulfilled its duty to consult with the Etchemin Tribe prior to enacting amendments to legislation that included a licencing and fine regime for fishing along the banks of the Etchemin River. Second, whether the government could justify the limits to the Aboriginal right. Kirsh argued the duty to consult issue and Ryant argued the justification analysis. Dal and Sherbrooke were both appellants in the preliminary round, and both were chosen as the top two teams to progress to the final round. In the final, Dal and Sherbrooke were required to argue the respondent side. Dal presented its arguments in English and Sherbrooke presented its arguments in French. Marie Claude Landry, Chief Commissioner of the Canadian Human Rights Commission, judged the moot. She sent a congratulatory email to Ryant and Kirsh after they won.